Screenshot of the LA Times' report, featuring a photo of the crucial moments by Chris Pizzello / Invision/Associated Press. You'll find a link to this article below. Okay, I'm starting to smell a rat. First Steve Harvey incorrectly names Miss Columbia at the 2015 Miss Universe contest, when it should have been Miss Philippines. Now La La Land gets the Oscar for Best Picture before the error is corrected and the statue is handed to the cast of Moonlight instead. It's as though they're doing this for publicity (if any was needed). But seriously, if you are organising an event - whether an awards night or a conference - this is your worst nightmare. Everyone loses, including the actual winner of the award, who ends up having to ditch their acceptance speech in favour of some pitying comments complimenting the runner-up. So, what can you do to minimise, if not avoid, such embarrassing moments altogether? From the outset, let me be clear: Steve Harvey and Warren Beatty are professionals, and fellow professional emcees are more likely to be empathetic than smug about their mix-ups. We understand the responsibility on our shoulders when we get on stage, and we know that the buck ultimately stops with us. But laying the blame solely on Harvey and Beatty is like saying only the goal keeper is responsible for conceded goals. It's a team effort, and if you dig a little deeper you'll find a confluence of reasons for why mix-ups like this happen. So, even if you are not producing the Oscars, here are seven things you can do to minimise similar embarrassing moments. Take time for rehearsals. The emcee must have the opportunity to take the microphone, walk across the stage to test for dead spots, and check to see that they have enough light and not too much glare to actually read their notes. Walk through the program together, ensuring the various elements actually link. The emcee must also have the chance to talk to the sound crew on the AV desk. It was the absence of rehearsals which lead to Mariah Carey's disasterous New Year's Eve performance in Times Square ("We didn’t have a sound check for this song, so we’ll just say it went to No. 1, and that’s what it is"). Choose a handheld microphone over lapel mics. They might not look as pretty, but handhelds fail less often and can be swapped easily in case they or their batteries die. Brief the emcee on the final program only. Some event managers think they're doing you a favour if they share with you every iteration of the event rundown, as it evolves in the weeks leading up to the event. In truth, this is more likely to confuse than clarify. Just provide the final script, and avoid further wholesale changes. Use fonts and colours. Palm cards - if you insist on using them - need to be understood at a glance. And because we no longer live in an age of typewriters, make use of the larger fonts and highlights at your disposal. Better still, invite the emcee to write their own palm cards based on information you supply. Hire a professional. Yes, I know what you're going to say. Steve Harvey and Warren Beatty are also paid professionals, yet they got it wrong. But if your event is to be memorable, and full of life and energy, somethimes things just happen. The difference is a professional will know how to deal with it. There are about a dozen more tips I could offer, but maybe you would like to share some, too. I welcome your comments. 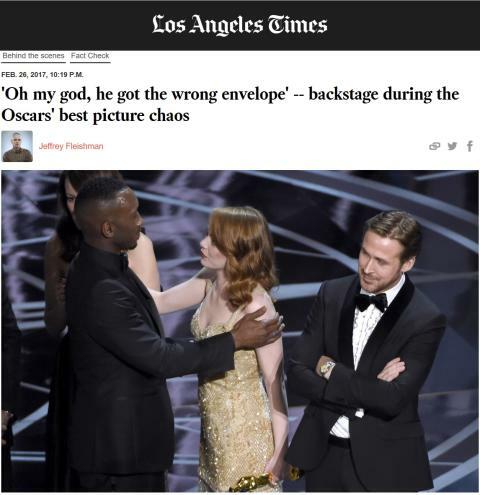 LA Times report: "Oscars 2017 updates: 'Moonlight' named best picture after Warren Beatty gets wrong envelope"